Requirements: Microsoft Interent Explorer WebBrowser component. If you have a system that does not have Internet Explorer installed, then CaptureSubmit will not work. Capture the data entered into an HTML form. Useful for batch programs, or programs that want to run in a stand-alone application mode and not have to be invoked by a web server. You get all the benefits of HTML for presenting a data entry form, but don't need a web server to process the input. CaptureSubmit.exe (415kb) Demo version, times out after 45 seconds. CaptureSubmit is a console application. This means the submitted data will be output on the programs stdout, so it can be captured, or piped to another program. CaptureSubmit was originally developed for use by SAS programs running in a stand-alone SAS DMS session. Thus, the default assignment-mode is SAS macro style, in the manner of macro variable assignments as done by the SAS/Intrnet product. All parameters except URL are optional. if you want to skip a parameter such as width, height, etc. Size and upper left corner postion of browser window. Remember, CaptureSubmit is designed to capture the inputs made to a form. It is not a general purpose browser; thus, you get only one navigating click, the submit button. If you click on a hyperlink that would cause the browser to display another page, then CaptureSubmit will close the browser window and its output will indicate a cancel action was forced. A browser window will appear. Type in CaptureSubmit for the search term and press Enter, or click on the Search button. The browser window will close and the form data, in SAS Macro assignment style, will appear in the command window. The Google search form had three fields; hl,q, and btnG. You now own this data. Do with it as you wish. NOTE: %INCLUDE (level 1) ending. When Submit Query is clicked, this XML will appear on stdout (the console window). 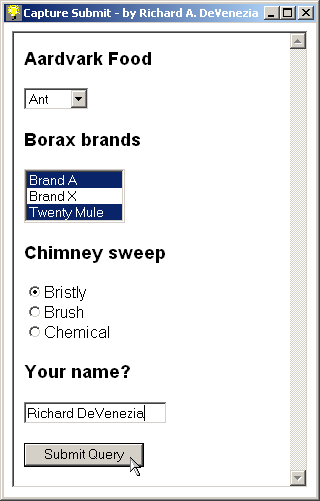 Note that mutiple selections use sequentially numbered names. 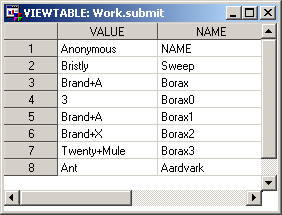 A SAS programmer can use the XML mode and process the inputs as if they were a SAS table. Acknowledgements: Thanks to Ciaran McCreesh for TStringHash, immortalized in Google Pastebin and Microsoft for WebBrowser. Perform conversions, packing and entity replacement within data values. Have a mode wherein multiply selected options are not sequentially indexed. Surface assignment of associativity model to a command line option that directs the program to a file containing model parameters specified in an xml construct. This page was last updated 11 May 2009.